Many people dream about staying home and not having to work. The trouble is many of those same people think it will happen overnight and do not want to do any work to get there. The truth is you can make money at home fast but it might not be $10,000 a month, at first. What would $50 more a month do for you? Wait only $50? You tricked me Marc. No I did not. In order to make $10,000 you need to first make $1.00 right? Well start with little goals and before you know it you will achieve your financial independence. So let’s get back to that question at the top. What could $50 a month do for you? You could buy an article of clothing, a couple of books you wanted, go out to that movie you want to see with your loved one, or even to a small lunch. You could even set up your own online business and pay monthly fees to make even more. What if I told you there is no reason you couldn’t make an extra $50 this month? Would you be interested? I am guessing you would say yes. Well, I have written a couple of article about how you can earn this easily with a little effort. One of the ways is with UserTesting. The premise is that you check out websites and comment on them in realtime and they take 5-20 minutes each. For a 5 minute test you get paid $3. For the longer tests you get paid $10 or more. Each test pays you in one week’s time. It doesn’t take long to make that $50. This is how I started this website. You can read more about it here. Another way is to do a little writing for someone else. You can do this on sites like iWriter. This site is great for someone who loves to write. You get topics and lengths of the topic to write about and you get paid for accepted articles. The money varies depending on your skill level and how long the article is. It is also a great way to get practice for your own blog. Payment are done based on your preference. You can get paid every Tuesday, every other Tuesday, or once a month if your earnings are $20 or more. Read more on iWriter here. Now you should be making an extra $50 or more a month from the two methods I outlined above. You might even have already made more than $100 in your first month. The question is what did you do with it? Did you invest it back into yourself in a program, buy books, buy clothes, go out and have a good time or even apply it to a bill you have? I personally like the idea of reinvesting in myself. Therefore, I chose to join and pay for Wealthy Affiliates with the extra money I earned. No money out of pocket, just a little bit of my time. By doing so you can make much, much more every month and even surpass your normal income. You can read my full review here. So what could you do with an extra $100? You could buy some music, get that upgraded phone you wanted but didn’t have the$100 sitting around. Not only that if you keep it up you have another $100 next month and the month after that. You shouldn’t stop there though. What could you do with $500 extra a month? The coolest part of this is you are just sacrificing some of your time and effort to make this extra money. With an extra $500 a month you could get a second car. Still not that $10,000 a month yet but if you keep it up you will get there. If you have debt an extra $500 a month could also help you tremendously with paying that debt down. At the very least it could give you some breathing room. You might even be able to have a weekend getaway. You just need to stay at it and be committed to reaching goals. Raise the bar on those goals as you achieve them and see your business flourish. What would and extra $1000 a month do? Wow, and extra four figures a month. This is truly possible, it might not happen the first month. For most people it takes some time to get there but if you are consistent and diligent in working on your business it will happen before you know it. The average student debt is $30,000 when they graduate. That is just crazy. Those student loans can cost $500 a month for several years. Well with an extra $1000 a month you could pay that off much quicker. One thousand dollars a month could get you some new furniture. Need a new bed, couch, recliner? Don’t get out that credit card, just wait until you get paid for the month from your part-time work at home and go buy it with cash! You could even upgrade your apartment or save for a house. What about $5000 a month? Five thousand a month is a good living. That is $60,000 a year. It is even higher than the average US household income of just over $51,000. Oh, did I forget to mention that this is for committing just a few hours a day? Most people could quit their 9 to 5 job with a side income of $5000 a month. This is not something that will happen right away, but what if you committed 1 or two years to it and you found yourself in that position. I think you would be ecstatic. Even if you don’t quit your job imagine the lifestyle change you could make. Can it really happen? Absolutely! Remember it just takes some time and commitment. The more effort you put into your business the better off you will be and the quicker you can achieve it. Who cares if it takes you 1 year or 5 years? Here is just one example of someone who did just that! At that pay you would be in the top 10% of incomes in the US. You need to believe how that can change your life and that you can do it. I know you can it just takes time. I know some people will say wow committing 5 years that is a long time. Let me ask you this: If you chose to do nothing, where will you be in 5 years’ time with your income? Most people will be make some more money but it will not change significantly. Everyone wants to make more money at home fast. They just want to shoot for the stars and expect to reach them quickly. The truth is you need to make $1 before you can make $10,000 a month. I showed you a path to get there overtime. I also, showed you the way to make an easy $50 or more a month that can help you start your journey to changing your life. Go ahead and give it a try stay committed and you can be looking back on this day and this article and say that is how it all happened. 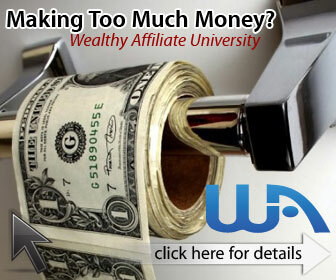 Try Wealthy Affiliate for free for 7 days, no credit card needed. I have used many things to become successful and you can see all of my recommendations here. If you are just interested in my top recommendations you can look here. If you have any comments, questions or your own personal experiences please post them below. Just read your article and out of all articles I have read that recommend wealthy affiliate, this one is my favorite because it steps out of bounds and promotes more ways to make money online instead of just wealthy affiliate. I really enjoyed how you described how extra income can really be effective. I wanted to know a few things about Iwriter, do you need to have any type of following or background in writing in order to start making money off the content you make for it? Same question for the comment on other people’s sites as well. Thanks for the comment. I believe it takes more then one thing to become successful online. What works for me may or may not work for you. I only give suggestions or ideas to people who really want to succeed but don’t really know where to start. As far as iWriter goes you do not need to have any kind of following at all. The requester has permission to use your writing as if it were their own. They might give you a byline, but they almost never will. Instead they will claim it as their own and publish it. So whether you have a following or not has no bearing on your ability to write for them. I hope that answered your question. Let me know. I could not agree more when it comes to Wealthy Affiliate. In the long run running your business is the best way to make money online. However I really like the first suggestions on your page.User testing and iwriter. The earnings on these sites seem really reasonable. Often paid surveys and other ways to earn online makes you very little money for the time you put in but iwritings and user testing seems to be a good way of making some extra money while you are working on your business. Thank you for the comment and I am glad you found WA. Making a little money on the side is great but building your own business in the process is even better. Please let me know if I can help you any way further. Hey! I just finished reading your article about making money on the internet with Wealthy Affiliate. I was interested to see what you had to say about it, as I have been a member myself now for some time. I totally agree with what you say here and I think this is one of the best online opportunities to earn online. However, making money with an online business is really hard. I have been working at this for just over 1 year. I can confirm that I have made way more money that I paid for my membership and this is a really great way to earn online, but donâ€™t expect an easy ride! I wouldn’t say it was hard, but that it takes work. Many people think they just set up a website and they will make money. That is not the case at all. Instead it takes time and effort on your part. It is something you can do in your spare time. You will make way more money online for your time, in the long run. The trouble is at first you can’t look at how much you are getting paid per hour and look at your time as an investment. The work is not hard at all. You do have to work for it though.